Some people doesn’t know, but anyone registered in the Firebird Tracker (registration is open, quick and free) can ask for improvements, report bugs, or vote in some existing tickets to raise their “priority”. It is true that a high ranked ticket may never be implemented/solved. It is also true that the FB developers are free to implement what they want, without following any specific order or wishes. In fact, a ticket can be left untouched for a long time, if none of the developers feel inclined to work on that issue. But it is also true that having the users community voting for items, may sign to the Core Team developers with a direction to follow. Note that the top 10 issues are not bugs (the FB Core Team is a very efficient bug killer 😉 ), but enhancements/improvements to Firebird. It seems that 775 and 657 are expected to be solved in Firebird 3. 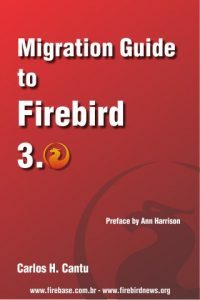 Core 773 and 2530 are related to the Firebird wire protocol. Sadly, the top voted item (2530) is still unassigned. If you ever tried to use Firebird over the Internet and felt it is too slow, this is the issue you need to vote 😉 This improvement requires a new wire protocol, and changes to the API that would break the currently third-party access components. So, not easy task, but I hope to see it implemented in the future.